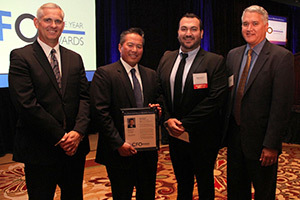 Financial professionals and guests gathered to celebrate the San Fernando Valley Business Journal’s annual CFO of the Year Awards on Tuesday, June 23. Century Group was proud to serve as a presenting sponsor at this year’s event, which honors the important work of CFOs in the area as financial stewards in public, private, nonprofit and government/public sector companies and organizations throughout various industries. The awards committee selected this year’s winners from 41 finalists, all nominated for the award by colleagues in the profession. The committee looked at a number of criteria for each person who was nominated, including the length of time they had been with their organization, the overall body of work in their career, the impact they made within their organization; the impact they made compared to their peer group, the financial success and stability of their company, and their involvement in both industry groups and the community. More details and photos from the event, as well as a profile on each honoree, can be found in the June 29 issue of the San Fernando Valley Business Journal.